What started as a brief after-work dog walk and research trip turned into an ordeal someone my age should know better than to get herself into. It was a warm sunny day, one of those glorious autumn gifts we experience here on the Oregon coast. Annie and I drove to the Beaver Creek Natural Area, a relatively new state park threaded with trails, most of which we had never tried or even found. I figured we’d park near the visitor’s center, walk enough to exercise the dog then drive around taking pictures for a writing project I’m working on. That’s not quite how it turned out. We started on the marsh trail, one we’ve done before, never getting too far because the dirt turned to mud, then muck, then water. Because the last couple months have been so dry, we were able to keep going, even after Annie pulled me into a patch of gooey mud that coated my “dress tennies.” We walked and walked across this vast land of yellow rushes and wide open spaces, birds our only companions. Suddenly the path ended at a bridge high above the creek. We crossed it. Then I saw the sign that would prove our undoing: Beaver Creek Loop Trail. Arrows pointed both right and left. I thought, hey, let’s take this. It will be a drier and possibly shorter path back to the visitor’s center. It was a lovely trail through the trees, along the creek, past skunk cabbage and ferns. But there wasn’t a soul around. We stepped over bear, cougar and deer droppings. 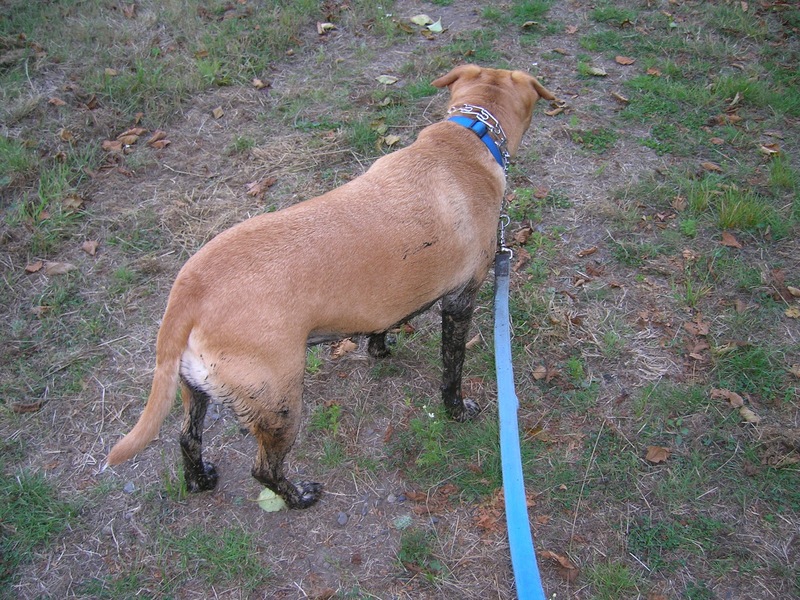 Annie, who can’t resist a pond or a puddle, decided to cool herself in the muddy stream beside the road and emerged black from the belly down, as if she had stepped in paint. “Come on!” I urged. The sun, barely visible over the trees, dropped toward the horizon and shifted from in front of us to the side as we gradually left the creek behind. As we walked uphill and down, I started to worry. It was already 6:00. The sun would set in an hour. Where was the end of this trail? What if a bear came out of the trees? I started praying. Finally, the trail curved and I saw buildings. Safe, I thought. But it wasn’t the visitor’s center. It appeared to be equipment storage sheds. No people, just a Port-a-Potty. The trail continued on. Now I could hear cars in the distance. There was road up there somewhere, but which road? More bear droppings. I tugged on Annie’s leash. No time to explore. We were losing daylight and I didn’t want to meet Yogi. Or even Boo Boo. We were definitely lost. I considered calling 911, but I couldn’t tell them where I was. We weren’t hurt or trapped like that “elderly” 65-year-old I had just read about who spent the night caught in blackberry bushes near Rose Lodge. Blackberries lined this trail, too. Delicious. But we weren’t leaving the trail for anything. At last I saw a metal gate up ahead. A road! It should be Beaver Creek Road, I assumed as we eased around the gate and stopped, looking right and left. Nothing seemed familiar. Were we above or below the visitor’s center? The sun had dropped to a yellow glow above the trees. I saw a milepost marker, Mile 1, to the right. The center wasn’t that far, was it? We went left. I wanted to cry. By now we had already walked for almost two hours. My shoes were pinching my toes. Annie was limping. I wished somebody would offer us a ride, although nobody would want my mud-painted dog in their vehicle. I felt old and foolish. “Thank you!” I called, and we got back on the road. They don’t allow much space between the white line and the bushes. Cars occasionally passed, us, pickups, SUVs, two PT Cruisers, all moving fast. Annie poked her nose into berry bushes and weeds as I kept urging her along. If it weren’t getting dark, there’d be no hurry, but it was. We passed the milepost marker and kept going. 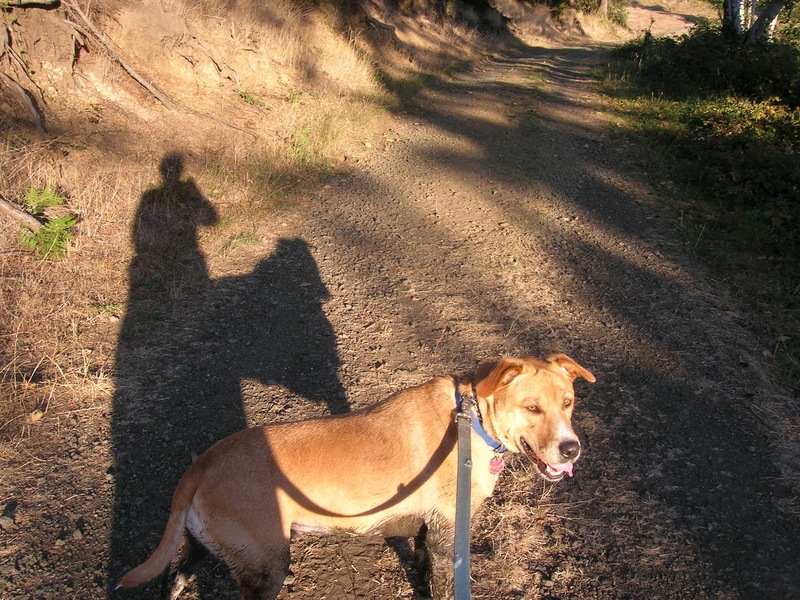 Annie plodded along in front of me, her legs black to the hips. “Hey girl,” I said. “If something tries to eat me, you’ll protect me, right? I’ll do the same for you.” She just kept walking. We crossed Beaver Creek, saw a couple fishermen in a boat. Waved as if we weren’t lost or exhausted. At last we came to the fork in the road. A stop sign. Green road signs. South Beaver Creek and North Beaver Creek. On NORTH Beaver Creek, a sign pointed us to the visitor’s center a quarter mile ahead. Somehow we had missed where the “loop trail” looped back to civilization and wound up on the road to Waldport. We turned, passed the center, now closed with a metal gate blocking the parking lot. Luckily I had parked a little farther up the road. My Honda waited for us. We collapsed into the seats and drove to the highway, turning onto 101 just as the sun was sliding into the horizon. It was the reddest sun I have ever seen. We were alive. We were safe. We were sore. The moral of this story is this: If you are not prepared for a long walk—alone with no map, compass, water, food, flashlight, or sleeping bag—go back on the trail you came in on, lest you wind up in the newspaper in your ugly pants and no makeup, being described as an “elderly” hiker who got lost in the woods. For a map of the Beaver Creek State Natural Area and its beautiful trails, visit the website at http://www.oregonstateparks.org/park_261.php. Don’t count on signs on the actual trails.